The front patio of the PCSU becomes a disaster area after rain storms now days. 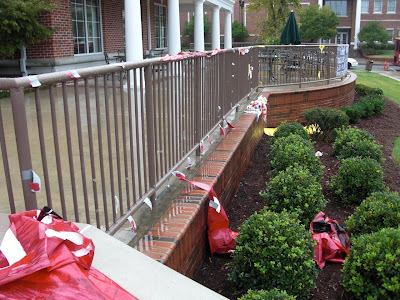 It seems that rain fought a battle against the banners hanging along the railing and in minutes shredded signs that took four hours or more to make. While we're on the topic of the non-waterproof banners, it's a rational question to ask why the front of the student union is becoming more littered with advertisement, essentially turning it into an outdoor bulletin board facing Alumni Park.